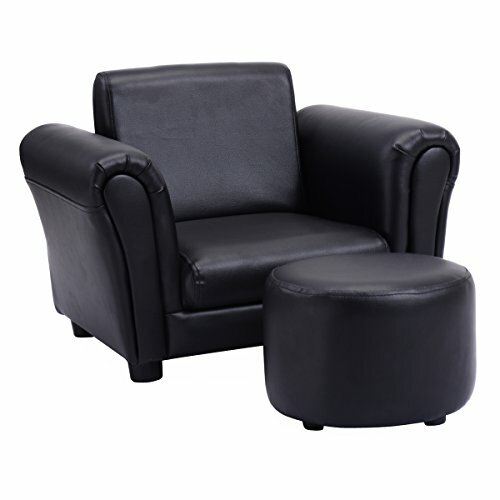 Description: Children's black armchair with matching Ottoman is a fun and multi-functional addition to any kids room. It makes a great reading seat or for putting your feet up in front of the TV. Kids can kick back in the chair form and use the accompanying ottoman to rest their feet after a long day of play. Ideal for any children's bedroom or playroom! Get one for your kids. They will love it! CUTE & DURABLE - Perfectly sized sofa for toddlers that gives them a spot they can call their own while reading, eating snacks, watching TV. Give your babies their own furniture! Constructed by wood frame and filled with soft sponge, Costzon kids sofa set features solidity and durability.